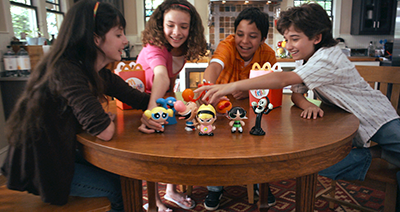 I served as writer/producer/director on this McDonald's commercial for Cartoon Network Happy Meal (Cajita Feliz) toys. It aired throughout Mexico, South America and the Caribbean in May 2008. The RED ONE camera (build 15), cast, crew, and designers were all superb, although, I have to admit I was more than a little nervous to experiment with an early build of the camera and an unknown workflow on such a high profile project. In the end, working with the RED ONE camera and resulting R3D footage went very smoothly, except for a slight bit of noise in the blacks that seemed to be the norm in pre-build 16 cameras. According to McDonald's, the agency, and our sales people, my spots set the bar for all future Cartoon Network-McDonald's co-branding promotions... the campaign was a huge success! The spot was a mix of 2K/4K live-action footage and Flash animation. Below is one of the finished spots and a slide presentation showing a few shots of us prepping the commercial as we waited for the crew to return from lunch and the kids to arrive from make-up and wardrobe. We had a great, large kitchen location... and we needed every inch of the adjoining great room for the opening & closing shots with the dolly to get the depth of field that I wanted. I'm not sure you can tell, but we only used a few lights and we raised the table & kids on a platform about 18 inches off the floor and covered it with a huge oriental rug, so we could see more of the kitchen behind their heads.